Sweetbrier, showing the barns and indoor ring on the hill. Many of us wonder how to measure success. Is it the amount of money you earn? What is the secret to success? As you may know, my family owned a beautiful riding school called Sweetbrier. 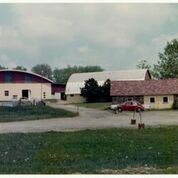 We were the first in the area to have an indoor riding arena. Although that was an element that added to our success, it wasn’t the whole story. Is the secret to success the little acts of kindness you show? Most people aren’t aware of the little things my parents did for students. For example, many young riders spent part of their weekend with us to help with farm chores and earn extra riding time. Most people don’t realize Mom often made lunch for students if they forgot to bring it, or if they mentioned they were hungry. My dad made special arrangements with people who struggled financially, but were passionate about riding and horses. I think those gestures are a secret to success. 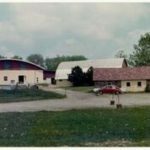 Sweetbrier was a special place and I think it’s a tribute to our farm and our family so many of our former students comment on the special memories at Sweetbrier. It’s a place where dreams came true. The post Sweetbrier: the secret to success appeared first on deaniehumphrysdunne.wordpress.com.